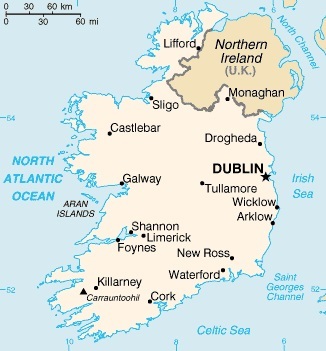 The Republic of Ireland (Irish: Poblacht na hÉireann) is a country in northwestern Europe. It shares a land border with the British province of Northern Ireland, and has a coastline on the Atlantic Ocean, Celtic Sea and Irish Sea. There hills and low mountains in the West and South of the country, including many cliffs on these coasts, but other parts of the country are largely low-lying and include make bog lands and lakes ("loughs"). 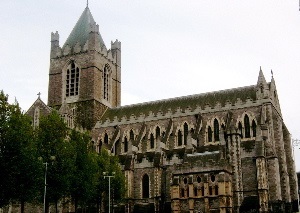 In recent years the population of Ireland has been generally growing, Principally because of the return of Irish citizens from other countries, and immigration. Today about 10% of the population of Ireland is made up of foreign citizens. As of 2006, the total population of the country was 4,234,925. 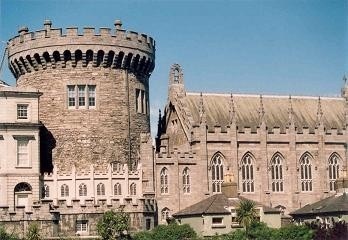 The largest city and capital of Ireland is Dublin. About 1 million people live in the Dublin metropolitan area, include about 500,000 within the city itself. Other important cities in Ireland include Cork, Galway, Kilkenny, Limerick and Waterford. Ireland's economy has traditionally focused around agriculture, however joining the European Union (in 1973), and adopting the euro currency (in 1998) has been of great benefit to the country. At one point, the country's GDP was estimated as the 2nd highest in the European Union (after Luxembourg), and the 4th highest in the world, although to be fair this was partly a statistical anamoly caused by the inclusion of profits from multinational companies based in Ireland but which ultimately leave the country. However, the global financial crisis has hit Ireland hard from 2008 onwards, so a period of austerity and adjustment is likely to be necessary.